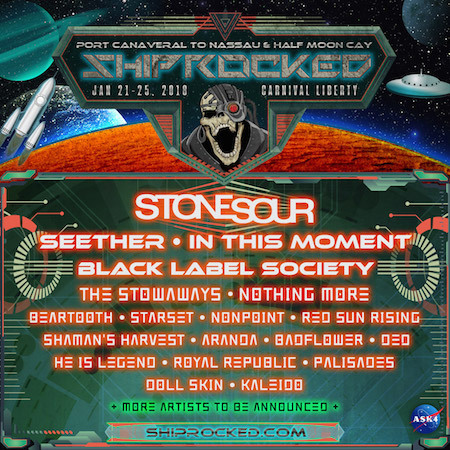 ShipRocked 2018 initial band lineup announced: Stone Sour, Seether, In This Moment, Black Label Society & more! 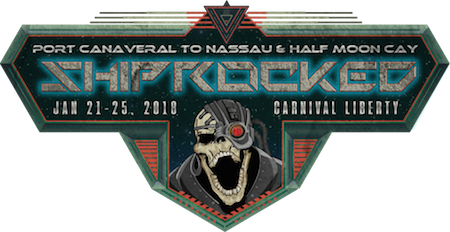 The initial band lineup has been announced for ShipRocked 2018 — "A ShipRocked Odyssey" — set for January 21-25, 2018 onboard Carnival Liberty. Stone Sour, Seether, In This Moment, and Black Label Society lead a lineup of over a dozen bands slated to play the ninth edition of the annual vacation experience as it sails from Port Canaveral, Florida to Nassau and the private island of Half Moon Cay in The Bahamas. "Finally. We've been trying to make this happen for a long time. Now Stone Sour is joining the ShipRocked party — and WE HOPE YOU'RE ALL AS EXCITED AS WE ARE!! There's gonna be music, excitement, craziness and maybe — JUST MAYBE… somebody's goin' to get naked. Come join us on ShipRocked!!" "We're really looking forward to being back on ShipRocked! We had a blast in 2016 and we intend to go even bigger on the next one!" In addition to Stone Sour, Seether, In This Moment, and Black Label Society, the otherworldly lineup for ShipRocked 2018 includes The Stowaways, Nothing More, Starset, Beartooth, Nonpoint, Red Sun Rising, Shaman's Harvest, Aranda, Badflower, DED, He Is Legend, Royal Republic, Palisades, Doll Skin, and Kaleido, with more to be announced. ShipRocked's resident all-star band The Stowaways returns in 2018 for a pair of special shows with its revolving cast of special guests, bringing a mix of classic hits, unexpected surprises, and a roster of performers that can't be seen anywhere else. Check www.ShipRocked.com for the latest on ShipRocked 2018 and The Stowaways' 2018 lineup. ShipRocked producer Alan Koenig of ASK4 Entertainment says, "We are very proud that the ShipRocked experience continues to grow, and gets better and better with each sailing. This year, we're primed and ready to take our 9th voyage to infinity and beyond, combining two of our favorite things, space and great live rock music! Blasting off from Port Canaveral with an incredible lineup, 2018's mission will continue to push the limits and promises to be the most out of this world vacation yet, taking one small step for man, one giant leap for ShipRocker-kind!" ShipRocked 2017 sold out in record time and sailed from Miami on January 16 onboard Carnival Victory for four days and nights of a three-ringed floating rock 'n' roll circus on the high seas, led by headliners Breaking Benjamin, along with Papa Roach, Alter Bridge, Sevendust, Pop Evil and more. 3,000 ShipRockers shared in "The Greatest Vacation On Earth," enjoying a packed itinerary of more than 40 performances from 20+ bands — including a pair of unforgettable deck stage sets from ShipRocked's own all star band The Stowaways — a day on the beach on beautiful Grand Turk in Turks & Caicos, sideshows, theme nights, and more.